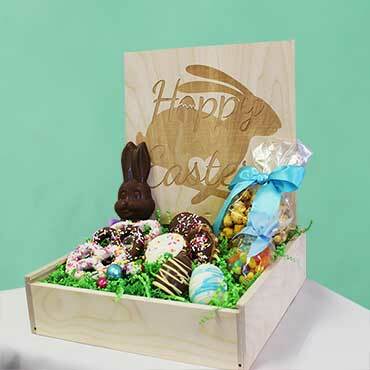 Every-Bunny will love this wooden gift box hand packed with solid Milk and White Chocolate Eggs, Spring Milk and White Chocolate Gophers, Milk Chocolate smothered Oreos with Spring Sprinkles, Milk and White Chocolate Pretzels decorated with Spring Sprinkles, Jelly Beans, Glazed Pecan Caramel Corn, Milk Chocolate foil wrapped Eggs, and a Milk Chocolate Bunny Lollipop! Five stars for product - recipient was pleased with appearance and content. Three starts for shipping - do not believe projected dates shown in checkout process when choosing shipping date. Even adding an extra day cushion, my gift arrived a day late. The Easter boxes came when expected and were filled with wonderfully packed goodies for my family.